Egg yolks are not a good source of dietary calcium. A good source of a nutrient provides 10 to 19 percent of its daily value, or DV, while an excellent source provides at least 20 percent of its DV, according to the Food and Drug Administration. A single egg yolk provides only 2 percent of the DV of calcium. However, eating an egg yolk enhances your body's ability to absorb calcium from calcium-rich foods. Your body only absorbs about 30 percent of the calcium ingested in foods. What you eat with your calcium source can impact its absorption level, according to the Office of Dietary Supplements. Pairing a food high in calcium with a food rich in vitamin D enhances calcium absorption. A single large egg yolk provides 10 percent of the recommended dietary allowance, or RDA, of vitamin D, making it a good source of this nutrient. An egg yolk provides almost 2 mg of highly absorbable lutein and zeaxanthin, two carotenoids beneficial for eye health. The Linus Pauling Institute at Oregon State University suggests consuming 6 mg of dietary lutein and zeaxanthin daily. An egg yolk provides 27 percent of the adequate intake, or AI, of choline for adult women and 21 percent of the AI of choline for adult men. 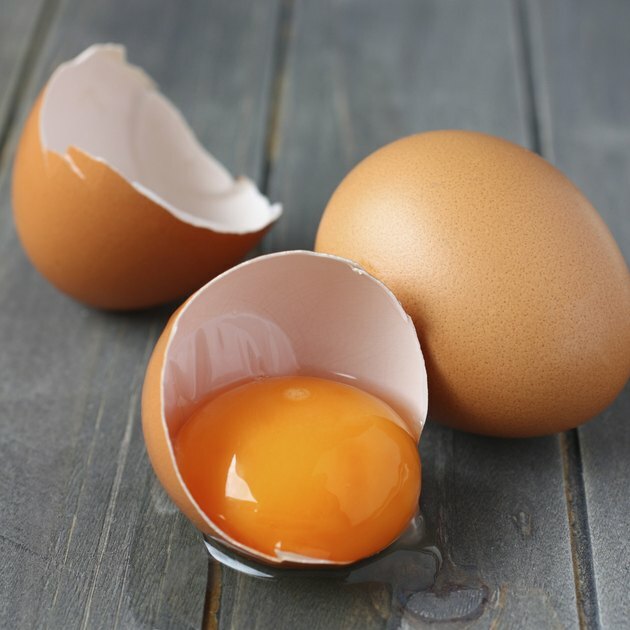 An egg yolk also offers 17 percent of the RDA of selenium and 9 percent of the RDA of phosphorus. A cup of plain, low-fat yogurt tops the Office of Dietary Supplements' list of excellent sources of calcium, providing 42 percent of the DV. A cup of calcium-fortified orange juice follows closely, providing 38 percent the DV. Additional excellent sources of calcium include mozzarella cheese, canned sardines with bones, low-fat fruit yogurt, cheddar cheese, all types of cow's milk, firm tofu made with calcium sulfate and some fortified breakfast cereals, drinks and soy beverages. Canned pink salmon with bones, cottage cheese, soft tofu made with calcium sulfate, instant chocolate pudding made with 2 percent milk, soft-serve frozen yogurt and boiled turnip greens are good sources of calcium, along with certain fortified soy and breakfast drinks and cereals. A cup of boiled spinach provides 25 percent of the DV of calcium, but a cup of raw spinach provides only 3 percent of the DV of calcium.